Do you know Colorways with Leslie Stocker? 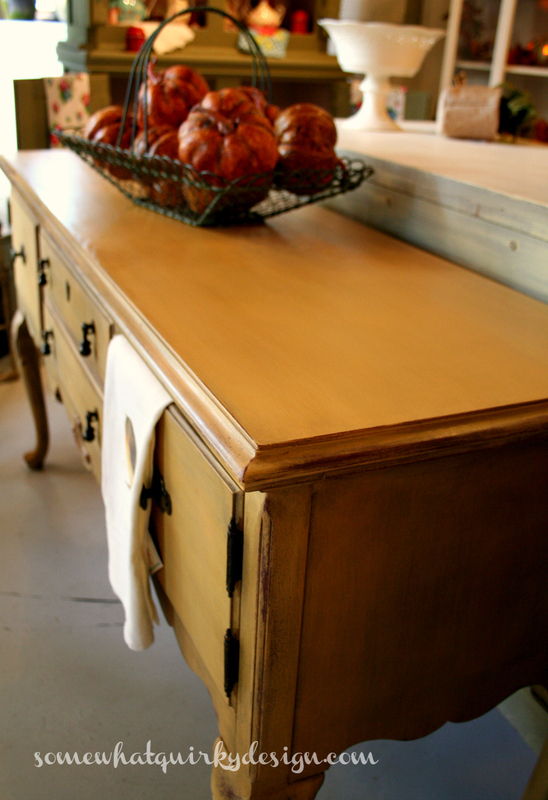 If you want fabulous inspiration for beautiful paint finishes, you should. 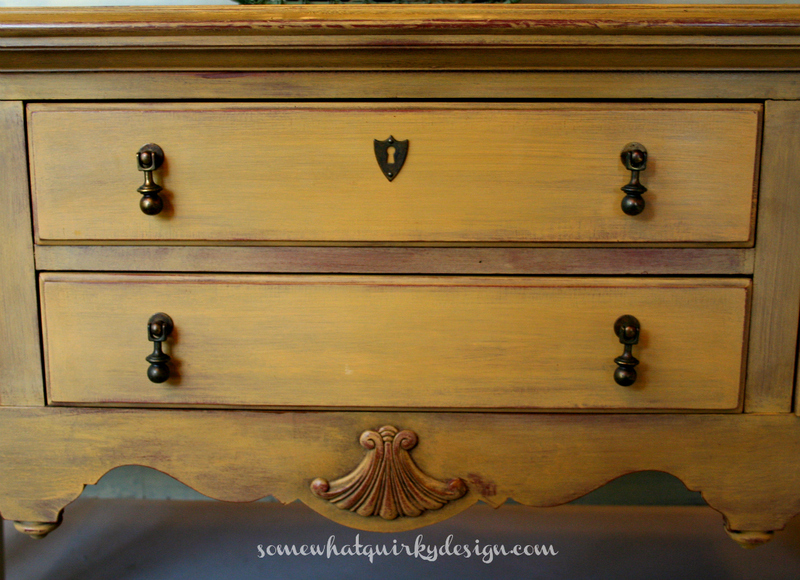 She does short posts with a picture of a beautiful finish with a breakdown of the Chalk Paint by Annie Sloan colors needed to achieve the look. Just seeing the piece broken down into colors makes me feel like I can do it. So, a while back I saw this. I was painting a piece for Vera's Daughter and knew that it was the perfect finish for it. This is Arles over Primer Red. I'm told this is called "two color distress" - where one color sands back to reveal another. Those knobs could be my favorite thing about it. This is the original hardware. The finish was perfect so there was no reason to paint it. I had never worked with Primer Red before. It is much prettier than I thought it would be. I had the perfect wallpaper for the drawers. It's for sale at Vera's Daughter. 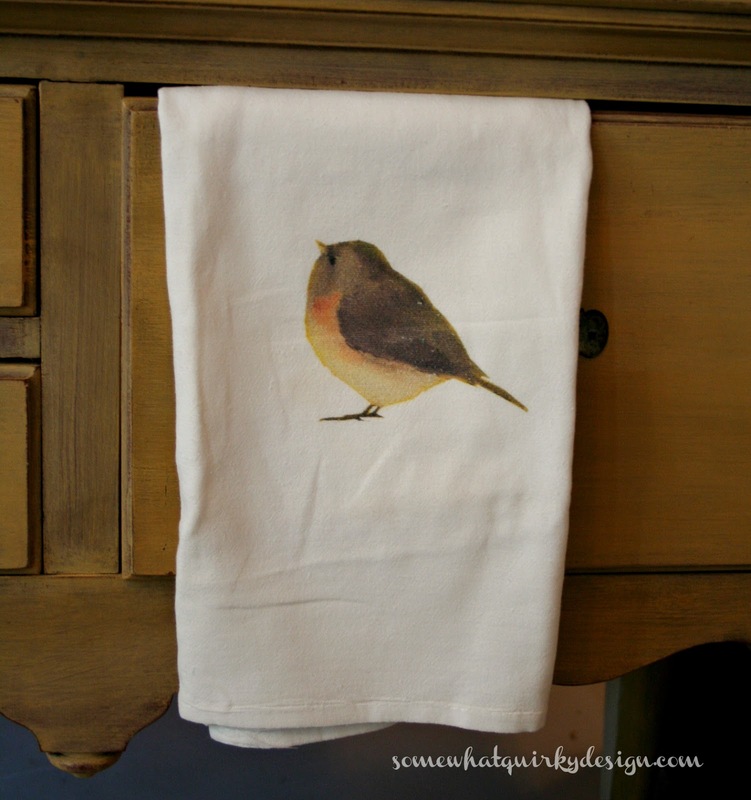 Don't you love this towel by Mary Gregory Studio? Soooo sweet! 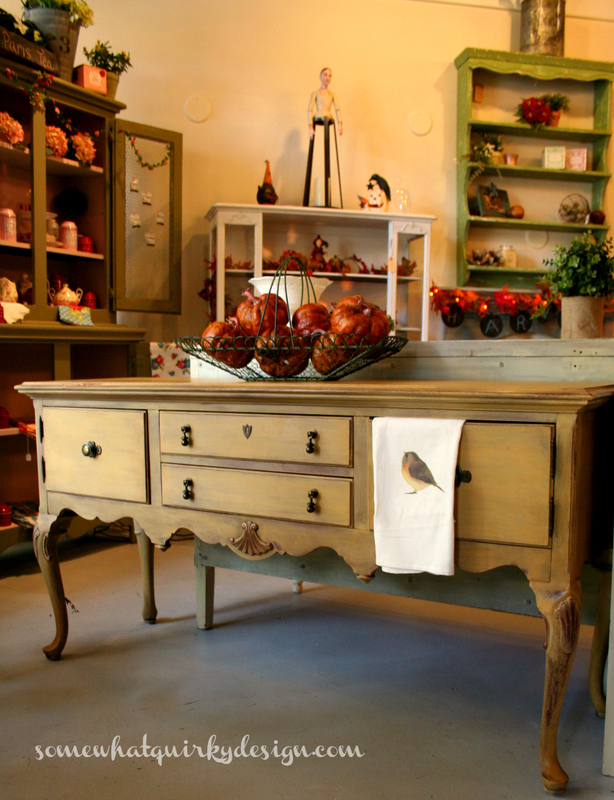 There's more from Mary Gregory at the store as well. 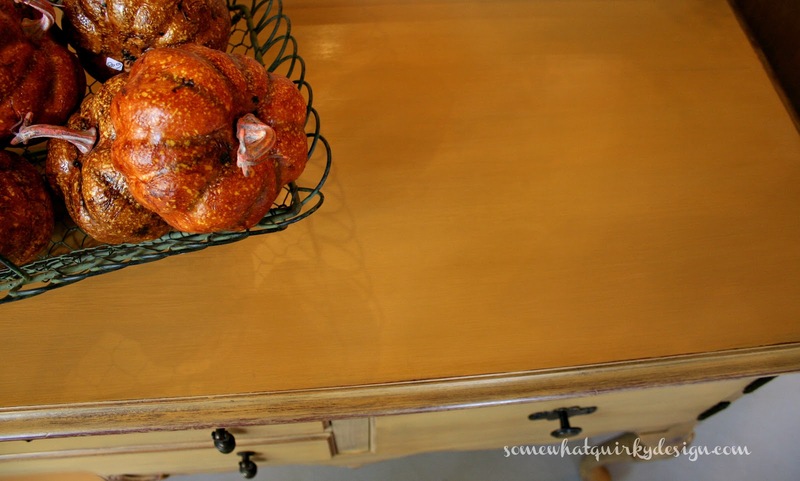 I hope you will check out more color inspiration at Leslie Stocker's place! That is stunning! I love the colour. Wait, Karen you did this? This is gorgeous!!! This is so warm...I love it! It is a lot like the colorway I used in our last house. (Lots of reds and golds and olive greens.) 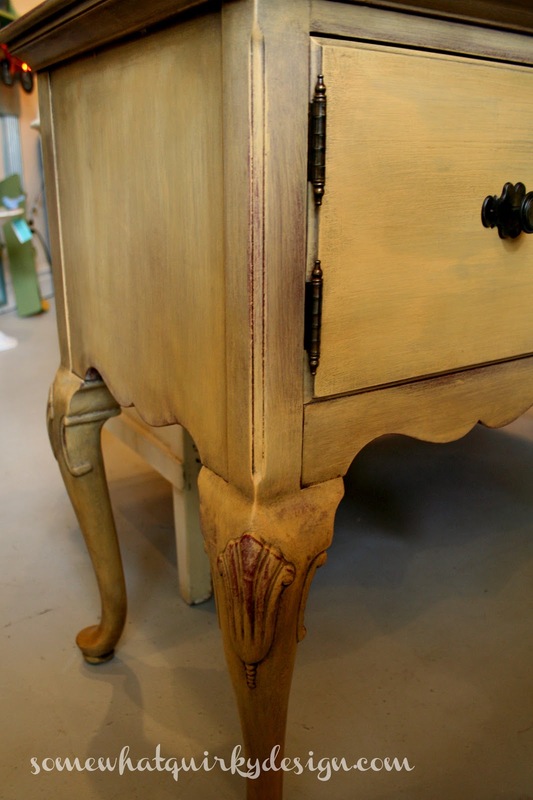 And the tip about mineral oil is great...I bet it makes it a smoother finish, I find that when I try to wax the top of a big piece, the wax "catches" and doesn't give a smooth finish. I'm going to try this! Oh how lovely! 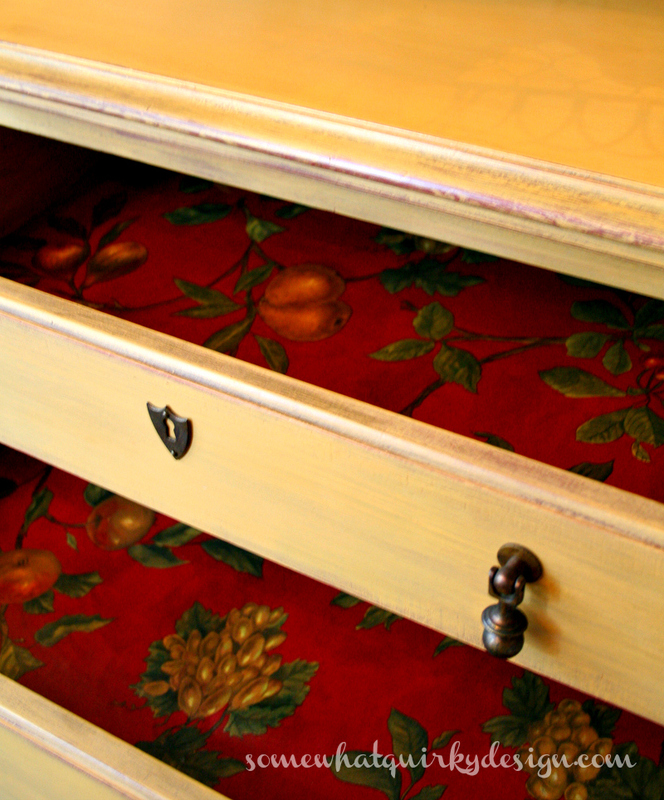 I love the red color showing through and the wall paper lining in the drawers makes it even prettier. Nice job Karen, bet it sells fast! Your work always catches my eye. So beautiful! Have to show this to a friend...she will love it! Gorgeous finish! It would add a nice warm wood tone to any room. I love it! Fantastic makeover! Congratulations on all of your features this week! 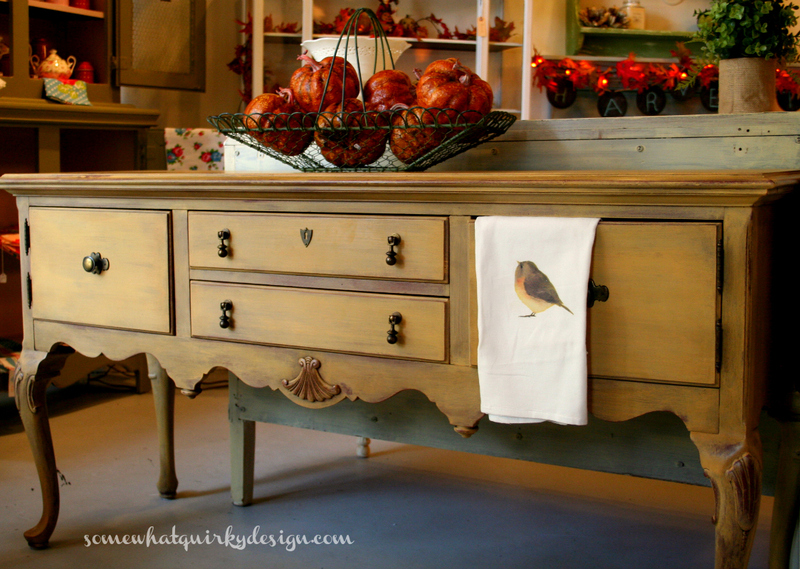 I could hardly wait to pin your beautiful buffet to my "Paint it Annie" Chalk Paint® inspiration board! Found you through MMS. :) What a beautiful piece! Fantastic job! Ohhh . . . this is so beautiful! I am working on a buffet right now and I hope I can bring it to a place of beauty like you've done with yours. Found you at MMS's party! Amazing! I love this so much that I bragged about you for Friday Favorites. I hope you stop by to see your feature.